The Trump EPA is expected to take the first step tomorrow in formally repealing and replacing the Clean Power Plan (CPP), the first-ever regulations on CO2 emissions from existing power plants and the crown jewel of the Obama administration’s Climate Action Plan. While it will take time to assess the potential impacts of the EPA’s new proposed path forward, in this note we take a fresh look at what the CPP would have achieved if it had been implemented. We find that if states took full advantage of compliance flexibility the CPP would have achieved reductions of as much as 72 million metric tons a year on average and much more than that if states chose to comply on their own. Depending on energy market trends, 12 to 21 states would have had to do something to comply with the CPP while the rest would meet or exceed their requirements through existing efforts. The CPP has been a dead reg walking since election day. President Trump campaigned on a platform that included repeal and once in office his EPA administrator Scott Pruitt secured a court-sanctioned pause in implementation while the new administration reviewed the rule. Now, EPA intends to rescind the CPP and issue an Advanced Notice of Proposed Rulemaking (ANPR) that resets the regulatory process and revisits fundamental questions about whether and how to regulate CO2 from power plants. We’ll leave assessment of the ANPR for another day. In the meantime, we’ve constructed fresh estimates of what the CPP would have achieved nationally and in each state using our Taking Stock projections updated with the latest state policy actions and changes in the electric power fleet such as recently announced coal retirements. For this analysis, we used RHG-NEMS, a version of the EIA’s National Energy Modeling system modified by RHG to reflect our own energy market and economic assumptions and to project energy and emissions outcomes at the 50-state level. We modeled a range of energy price and technology cost scenarios. For natural gas, we explored 2030 Henry Hub prices between $3,75 and $5 per MMBTU. For renewables, we explored cost declines ranging from those included in the EIA’s 2017 Annual Energy Outlook to those in the National Renewable Energy Laboratory’s most aggressive cost reduction scenarios. We then compared power sector CO2 emissions under these projections for each state with what the CPP would have required under a cap on existing and new power plants. There has been a significant decline in national power sector emissions since the CPP was drafted. The final rule, released in 2015, was assessed based on 2014 energy market projections. In the Annual Energy Outlook (AEO) released that year, the EIA projected modest recovery in power sector CO2 emissions from 2012 lows to 8% below 2005 levels by 2030 (Figure 1). Against this baseline, the CPP was projected to have a significant impact. EPA estimated it would reduce power sector CO2 emissions to 32% below 2005 levels by 2030. 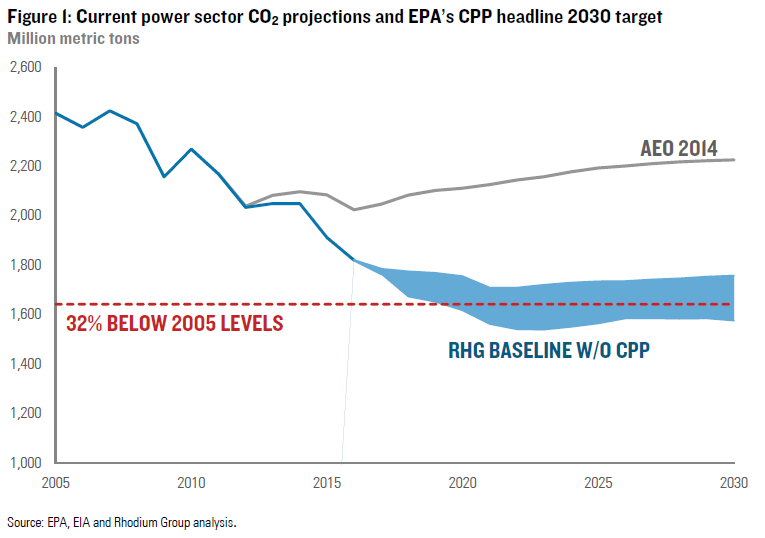 Our current projections put power sector CO2 emissions 27% to 35% below 2005 levels – bookending EPA’s target for the CPP. Gas prices have stayed lower for longer than EIA predicted, electricity demand has remained flat, rapidly declining wind and solar costs and a multi-year extension of the PTC and ITC have driven aggressive renewable energy deployment, and many coal-fired power plants have been retired. Does that mean the CPP is OBE and the EPA’s announcement tomorrow will have no real emissions impact? Not quite. The 32% number was a rough national estimate. Actual targets under the rule were set at the state, not national, level. To get an accurate sense of what would have occurred if the CPP had taken effect, you need to do the state-by-state math. Under the CPP states would have had the option to allow power plants to trade compliance credits with plants in other states. If a state was on track to exceed its requirements the surplus credits could be used to make up the difference in another state. This flexibility could lower the overall cost of the program but it also could limit emission reductions from the CPP as states that exceeded the goals traded away their gains to states that had to do more. 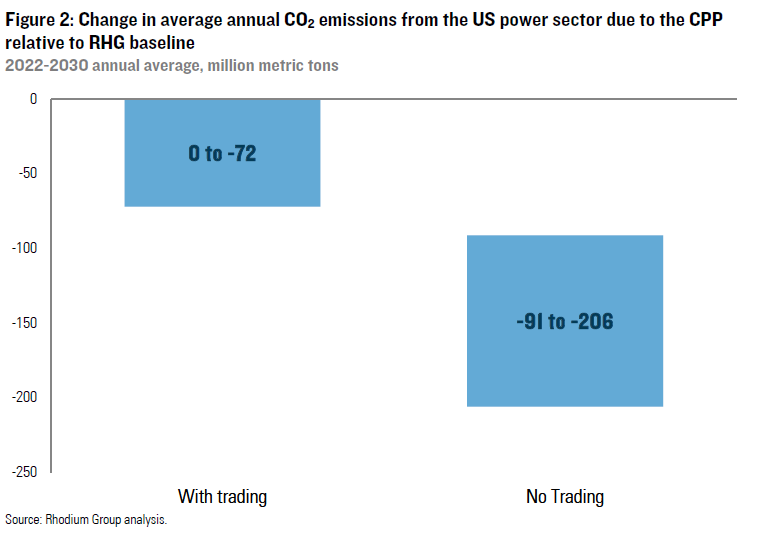 Assuming all states took advantage of trading we estimate that the CPP would have achieved no additional emission reductions in a future where gas remains cheap and renewable energy costs decline rapidly, and as much as 72 million metric tons a year on average with more expensive gas and renewables during the 2022-2030 CPP compliance period (Figure 2). However, if states chose not to trade, states that exceeded requirements would have held on to their gains and states faced with a burden would have had to do more within their borders to comply. This would have led to more significant emission reductions of 91 to 206 million metric tons per year on average over the same time frame, and national power sector emission reductions that exceed the 32% headline objective set by EPA. So for certain states, tomorrow’s announcement is a pretty big deal. Different states have different power fleets, different energy markets, and different policy regimes. Meanwhile, the CPP focused its reduction requirements on coal-heavy states since that’s where the emissions are. Add future energy market trends into the mix and the result is the overall CPP emission reduction burden requirement for each state. Under our scenarios, we find that at most, with the highest renewable energy and natural gas prices analyzed, 21 states would have had to do more to comply with the CPP than what they were already on track to achieve in absence of the rule (Figure 3). The top 5? Texas, West Virginia, Georgia, Pennsylvania, and Wisconsin. 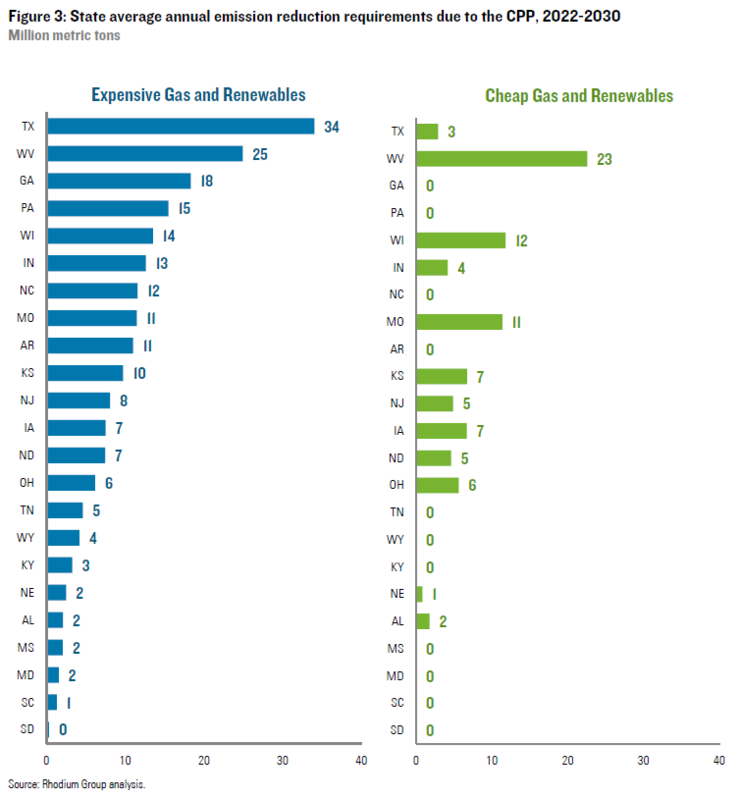 At the other end of the natural gas and renewable energy price spectrum, 12 states would have had to do more with West Virginia, Wisconsin, Missouri, New Jersey, Iowa, and Kansas (tied for 5th) facing the most substantial burdens. With tomorrow’s action EPA will remove the burden of these states and start the regulatory process anew. We plan to track this process closely. The big emissions reduction potential of the CPP, however, was not in the specific targets included in the 2015 final rule. If upheld by the courts and implemented by EPA, the CPP would have created a national regulatory framework and de facto emissions trading system that would have enabled target ratcheting as energy prices, technology costs and baseline emissions projections changed. That framework will be significantly eroded, if not completely undone. Its fate is now in the hands of Scott Pruitt and team who, starting with the ANPR process could maintain some notion of a regulatory regime for CO2 from power plants or attempt to erase it completely. Either way, several years of regulatory process and subsequent litigation await.